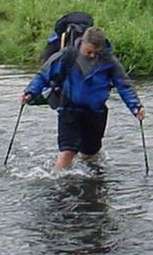 Hiking sticks and hiking staffs are the same thing - a long, wooden limb carried while hiking and used for many purposes, primarily to aid in hiking up and down trails. 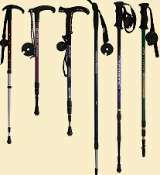 Hiking poles are new, hi-tech gadgets that look like ski poles but have a wide range of features and prices. Let's check 'em out. Increase Endurance - using poles offloads some of the work from your legs to your arms. This spreads out the work and lets you hike longer. Climb Hills Better - on steeper grades, the benefit of using poles increases. Your legs work significantly less. Better Balance - like outriggers on a canoe, you can navigate rough or loose ground more safely. Reduce Knee Stress - the lighter load on your legs may result in less knee trouble. But, knee problems should be checked by a doctor too. Increased Workload - poles spread the workload to more muscles but they also increase the amount of work done. Your legs may not be as tired, but your whole body will need to work harder. Poor Technique - unless you learn to use your poles correctly, you won't achieve any of the benefits and they will just be a burden. I've used hiking sticks since I started hiking with my dad. As a kid, its natural to pick up a stick and throw it or hit your brother with it. When you find one that just feels right, you hang onto it and start using it to help your way up the steeper stretches. That's how I started using sticks. And, that is how I still get hiking sticks - I pick them up on the path. Pretty much every multi-day hike I go on, I'll find a stick and then start carving on it whenever there's a resting point. On this page, you can see a couple of the sticks I've carved on. These are from boy scout camping and youth group trips. It's fun, gives the kids something to talk to me about, and keeps me out of trouble. Not to mention the benefits of having a good, sturdy hiking stick to help with the trek. I actually use the sticks too. I think the reason I like hiking sticks so much is because they are a free, natural thing that makes my time in the wild more enjoyable. When I carve on my stick, it also becomes a reminder of the outing, sort of like taking pictures. But, probably the reason I like hiking sticks better than hiking poles is the free part. :-) I'm kinda cheap and hiking poles are definitely not cheap. They are tools for a niche market which means they can be pricey. 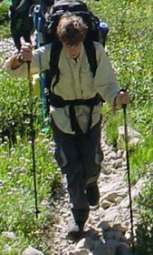 Hiking poles are useful much like hiking sticks, except that they are shorter, lighter, and metal. This means they are not as good at supporting your full weight. Other than that, you can do pretty much the same things with them as with a stick. Shock absorbing mechanisms - small springs that absorb some of the thunk of hitting the ground. Over a long, rough hike you may notice the difference. Rubber grips - more comfortable handling. The grip should encompass the top of the pole so you can grip it with your palm. Extendable lengths - many poles are made in 2 or 3 parts that telescope. Easier for packing and adjustable for other hikers or other uses. You can shorten the poles when climbing and lengthen when descending to maintain good balance. Make darn sure you have locked the pieces in place before starting out again. Baskets - a small basket near the tip to minimize sinking into mud or snow. When you hold your poles, use the wrist straps. Put your hand through the strap and then make a U or O with your thumb and fingers around the grip section. You should not need to tightly grip the pole but instead use your rist to put a load on the pole. Where you are holding the pole, it should swing freely sort of like an extra joint connecting the pole to your arm. On Steep Downgrades, poles are planted just a bit before the same foot. This provides stability for placing your foot and prevents twists and slips. Pushing down on the pole reduces the shock to the knee and leg when it lands. Your hands tend to be more at waist level when navigating steep downhill sections. [insert derogatory term here] and they always will. Here I am, having hiked with a stick for years and I find no need to switch. I know that I will start using hiking poles one day. It will happen like this: one of my relatives will see them in the L.L. Bean catalog and know I don't have any and buy them for me for Christmas. Then, I'll have to try them. Then, I'll find out how great they are and I'll be writing a page about how I don't understand how I could have ever gotten along without them. But, until that day happens, I'll stick to my stick and struggle along. I completely understand that a wooden hiking stick is heavier and can be more of a burden than an aid. But, I use one more for the feeling of having it than the need for it - my knees are strong, my legs don't get too tired, and I usually hike with people slower than myself. The help in balancing when crossing logs and rivers is when I get the most benefit from it. UPDATE: I did get a set of inexpensive, light-weight hiking poles from my sons for Christmas. On my long hikes, they have been a HUGE help. For going up and down steep trail, they really make a big difference, and I use them to set up my shelter too. For those of you wanting to extend your hiking abilities and have a more efficient hike, definitely check out hiking poles. Once you get used to using them, they will be a big benefit in your hiking. Here is my son and a friend using hiking poles to climb a steep trail and cross a stream in Wyoming. I agree that hikers should first of all get in shape, lose weight, and get used tot eh great outdoors. All over the world Africans, Asians, and Middle easterners either walk or use a wooden staff. Just a couple comments about hiking poles. No disagreements, just expanding upon your points. First, the shock aborbing systems are great when hiking on hard surfaces like asphalt roads or even hardpack dirt trails. We daily hike on and along asphalt roads and the anti-shock system is a huge benefit under those circumstances. Rubber fitness tips added to the poles are great for asphalt and grass but lose their grip on gravel. Secondly. grips of cork or cork composite are great for all weather use as they stay comfortable in all temperatures and are grippy even when wet. Futher, with grips, a forward cant is more comfortable than a straight grip; unfortunately most poles come with straight grips. The grip straps should also be wide and have some sort of secure speed lock mechanism for adjustment on the fly. Regarding the locking mechanisms on the poles, twist locks are the strongest type available but lever/cam locks seem to be more popular even if they are less secure. Just bought my poles. Found your information important. Like the exhaustive list of stick/pole uses provided above--a few I hadn't thought of. Years ago I used only 1 natural wood (self made) longer hiking staff and found this to be a big help with balance while crossing water, getting over (or under) blowdowns, etc. Then I tried a pair of shorter commercial trekking poles--loved the length adjust-ability (doubled for tent poles, too) and lighter weight compared to a long wood staff. First set of trekking poles used twist locks, which worked fine for a few years, then would NOT tighten when colder (bought replacement parts that did not help), and finally become unreliable and unusable. So I replaced them with poles using lever/cam locks, which I find to be much more reliable and user-adjustable (in contrast to "melensdad"'s comment above). It's strange that no one seems to make a walking pole of about 180 cm. or around 6 ft.I like that length so I have to make my own. I have a question about different hiking poles. In the state I live it is illegal to carry knives, expanding batons, etc. But twice I've been attacked by wild animals while hiking. I would like to find a hiking pole that is strong enough for defense, and collapsable is a plus. Since I walk with dogs I'd like to be able to just stow it unless I need it to hike. Any suggestions? @Chris - I blogged about my new poles in 2012 on this page. I'm STILL using that same inexpensive pair even though the ends are completely worn off and they are all scratched up. I just did a week backpacking in WY and will be going for a week in MN on Saturday. I checked online at Walmart and don't see the flip- lock style available now, but I like that better than the twist- lock. They collapse to 25 inches, and I've used them between me and snakes, dogs, brush, spider webs across the trail. When collapsed, they get strapped to my pack just fine. I'm curious about your animal attack stories - care to share more? Great info. I till can't bring myself to use trekking poles. Did get a commercial made hiking staff made from polycarbonate. Strong as could be and looks like an Irish blackthorn. After a mode has been real solid performer. Have picked up sticks along the trail as a kid but now older bending to pick up a sweet looking staff seems very not worth it. Valuable tools for many different reasons.